Better Buy: Intel Corporation or NXP Semiconductors? Both chipmakers posted disappointing gains compared to their industry peers, but could one bounce back before the other? Many chipmakers have rallied over the past year, thanks to improving sales of chips for mobile devices, Internet of Things devices, connected cars, and other gadgets. That optimism boosted the Philadelphia Semiconductor Index by 20% since the beginning of 2016, which easily outperformed the Nasdaq's 6% gain. However, two major chipmakers, Intel (NASDAQ:INTC) and NXP Semiconductors (NASDAQ:NXPI), underperformed the Philadelphia Semiconductor Index by a wide margin. Intel shares rose just 6% during that period, while NXP gained a mere 3%. Did those two stocks underperform the sector for valid reasons, or are they poised to catch up? Let's compare the two chipmakers' core businesses, growth, and valuations to decide. What do Intel and NXP sell? Intel is the world's largest manufacturer of x86 CPUs for PCs and servers. Its core client computing business, which includes its PC chips, generated 54% of its revenue last quarter. The data center group accounted for 30% of its revenue. The remaining 16% of Intel's revenue came from its programmable solutions group (programmable chips acquired from Altera), non-volatile memory solutions group, Internet of Things group, and Intel security group (formerly known as McAfee). Intel recently agreed to sell a majority stake in Intel security to private equity firm TPG. NXP sells a wide variety of chips for connected cars, security devices, and mobile chips. Through its acquisition of Freescale last year, NXP became the world's largest manufacturer of automotive chips. It also supplies the NFC (near-field communication) chips used for "tap and pay" payments and file transfers used by Apple (NASDAQ:AAPL) and other mobile device makers. NXP's BlueBox platform for autonomous cars. Image source: NXP. Last quarter, 36% of NXP's sales came from automotive chips, 22% came from SCD (secure connected devices) chips, 19% came from its SI&I (secure interface and infrastructure) business, and 8% came from SIS (secure identification solutions) chips. These chips are all classified under its HPMS (high-performance mixed signal) division. Thirteen percent of NXP's revenue came from its standard products division, which sells discrete, logic, and PowerMOS chips to a wide variety of industries. NXP is currently divesting this slower-growth unit to Chinese investment firm Jianguang and private equity firm Wise Road Capital for about $2.75 billion. How fast are Intel and NXP growing? Intel's revenue rose just 3% annually last quarter, with a 3% year-over-year decline in client computing revenue and 5% growth in data center revenue. Its client computing sales fell due to the ongoing slowdown in PC sales and Intel's failure to gain a foothold in the mobile market dominated by ARM (NASDAQ:ARMH)-based chips. Its data center growth was also disappointing, because the chipmaker previously claimed that the segment could achieve 15% annual sales growth between 2015 and 2019. Looking ahead, analysts expect Intel's revenue to rise 4% this year. NXP's revenue rose 57% annually last quarter, but that figure was greatly inflated by the Freescale acquisition, which closed last December. On a combined and adjusted basis, which normalizes those figures, NXP's sales actually fell 8%. Automotive revenues rose 5%, but that growth couldn't offset double-digit declines across all three of its secure solutions businesses. A large part of that decline was caused by lower orders of NFC chips for mobile devices, which are included in its SCD segment. Analysts expect NXP's revenue to rise 55% this year, due to the purchase of Freescale, but only grow 5% next year. NXP also faces significant Brexit-related eurozone headwinds, since the chipmaker is based in the Netherlands. The aforementioned divestment of its standard products unit could also weigh down year-over-year comparisons. Intel's GAAP net income fell 51% annually to $1.3 billion, but that still gave it a decent net profit margin of 9.6%. On the same basis, NXP reported a net loss of $13 million last quarter, compared to a profit of $300 million a year earlier. 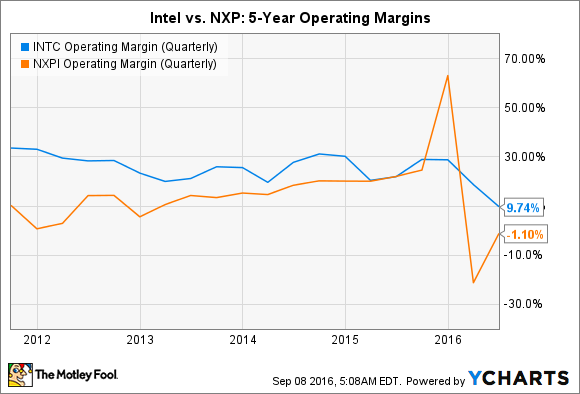 That's because Intel's operating margins have been consistently higher than NXP's. Analysts expect Intel to post 7% non-GAAP earnings growth this year and an average of 10% earnings growth over the next five years. This gives it a five-year PEG ratio of 1.5, which is higher than the "undervalued" threshold of 1. NXP's non-GAAP earnings are expected to rise just 3% this year but improve 34% annually over the next five years as the market for connected cars grows. This gives NXP an "undervalued" five-year PEG ratio of 0.5. Intel is still a solid "mature tech" play with a decent forward dividend yield of 2.8%, but its upside potential is limited by the sluggish PC market, its low exposure to mobile devices, and its questionable ability to challenge ARM-based chipmakers in new markets like IoT. NXP doesn't pay a dividend, but it arguably has more room to grow in connected cars and NFC chips, and its lower PEG ratio also makes it a better long-term growth play. Therefore, I believe that NXP is clearly a better buy than Intel at current prices.